The Olympics may be dominating the headlines, but there's still lots of newsworthy things happening in the Wright world. The A.D. German Warehouse has a new website; Architect Toshiko Mori will be lecturing soon in Chicago; A Mid-century Modern work by an organic architect in Janesville, WI is for sale; and read about a visit to Wright's incomparable Dana House. Recent 5-Star Review from Karl K.
"We have a Prairie-style house with a lot of dark trim and furniture. This pillow fits our home design and breaks up the dark wood and leather nicely. We haven’t had it long enough to see how it holds up to wear & tear but, if it proves durable, we will order several more." 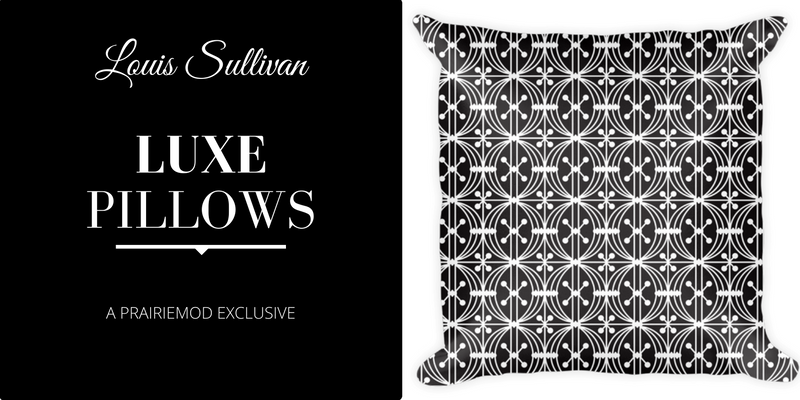 Wright Society readers save 10% off all Luxe Pillows from PrairieMod this week only. Shop Now and use code 0816WS at checkout through 11:59PM CT August 14, 2016. Lon Arbegust sends word that the A.D. German Warehouse Conservancy, Inc. just launched its new website promoting the Frank Lloyd Wright-designed building in Richland Center, WI. Be sure to check it out, plan a visit, and help them raise the funds to restore it! Read more. Toshiko Mori is the 2016 speaker for the Frank Lloyd Wright Trust’s annual program, "Thinking Into the Future: The Robie House Series on Architecture, Design, and Ideas." that will be held on Thursday September 29, 2016 at the Reva and David Logan Center for the Arts at the University of Chicago. In her talk, "Dialogue in Architecture", Mori will discuss how architecture develops languages and dialogues that reflect and respond to complex circumstances and contexts. Follow the link to learn more and order tickets to this exciting event. Read more. Scott Templeton sends word that a Mid-century Modern home designed by organic architect Arthur A. Carrara is on the market for $395,000 in Janesville, WI. See the listing and more photos by following the link. Read more. Theresa Churchill of the Herald & Review recently toured Frank Lloyd Wright's Prairie masterpiece, the Susan Dana Lawrence Residence in Springfield, IL. Follow the link to read more about her experience. Read more.